As a powerful electrical storm rages on Saturn with lightning bolts 10,000 times more powerful than those found on Earth, the Cassini spacecraft continues its five-month watch over the dramatic events. Scientists with NASA's Cassini-Huygens mission have been tracking the visibly bright, lightning-generating storm--the longest continually observed electrical storm ever monitored by Cassini. Saturn's electrical storms resemble terrestrial thunderstorms, but on a much larger scale. Storms on Saturn have diameters of several thousand kilometers (thousands of miles), and radio signals produced by their lightning are thousands of times more powerful than those produced by terrestrial thunderstorms. "The electrostatic radio outbursts have waxed and waned in intensity for five months now," said Georg Fischer, an associate with the radio and plasma wave science team at the University of Iowa, Iowa City. "We saw similar storms in 2004 and 2006 that each lasted for nearly a month, but this storm is longer-lived by far. And it appeared after nearly two years during which we did not detect any electrical storm activity from Saturn." Cassini's radio plasma wave instrument detects the storm every time it rotates into view, which happens every 10 hours and 40 minutes, the approximate length of a Saturn day. Every few seconds the storm gives off a radio pulse lasting for about a tenth of a second, which is typical of lightning bolts and other electrical discharges. These radio waves are detected even when the storm is over the horizon as viewed from Cassini, a result of the bending of radio waves by the planet's atmosphere. Last edited by nick c on Fri Mar 25, 2011 10:51 am, edited 1 time in total. A bright, powerful, lightning-producing storm churns and coasts along the lane of Saturn's southern hemisphere nicknamed "Storm Alley" by scientists. NASA's Cassini spacecraft detected this particular tempest after nearly two years during which Saturn did not appear to produce any large electrical storms of this kind. The storm appears as a bright, irregular splotch on the planet near lower right. Lightning flashes within the persistent storm produce radio waves, called Saturn Electrostatic Discharges, which the Cassini radio and plasma wave science instrument first detected on Nov. 27, 2007. Cassini's imaging cameras then spotted the storm, taking the images used to create this color view about a week later on Dec. 6. Scientists gave the nickname "Storm Alley" to the area around 35 degrees south latitude because of the large amount of activity seen there from the beginning of the Cassini spacecraft's approach to Saturn in early 2004. The region has spawned two large and powerful storms since the Cassini spacecraft began observations. This image of saturn remindes me of one of the structures that ferrofluid takes in a changing magnetic field. I know there is a video our there which shows this but my playing is not cooperating so I can find it. Ion01 wrote: This image of Saturn reminds me of one of the structures that ferrofluid takes in a changing magnetic field. It's also reminiscent of the Dragon Storm which I think Wal Thornhill has likened to a diocotron instability. The discovery of the wave pattern is the result of a 22-year campaign observing Saturn from Earth (the longest study of temperature outside Earth ever recorded), and the Cassini spacecraft's observations of temperature changes in the giant planet's atmosphere over time. The Cassini infrared results, which appear in the same issue of Nature as the data from the 22-year ground-based observing campaign, indicate that Saturn's wave pattern is similar to a pattern found in Earth's upper atmosphere. The earthly oscillation takes about two years. A similar pattern on Jupiter takes more than four Earth years. The new Saturn findings add a common link to the three planets. Just as scientists have been studying climate changes in Earth's atmosphere for long periods of time, NASA scientists have been studying changes in Saturn's atmosphere. Glenn Orton of NASA's Jet Propulsion Laboratory in Pasadena, Calif., says patience is the key to studying changes over the course of a Saturnian year, the equivalent of about 30 Earth years. The wave pattern is called an atmospheric oscillation. It ripples back and forth within Saturn's upper atmosphere. In this region, temperatures switch from one altitude to the next in a candy cane-like, striped, hot-cold pattern. These varying temperatures force the wind in the region to keep changing direction from east to west, jumping back and forth. As a result, the entire region oscillates like a wave. Cassini scientists hope to find out why this phenomenon on Saturn changes with the seasons, and why the temperature switchover happens when the sun is directly over Saturn's equator. Nice images. Don't they bring us back to petraglyphs? And cymatics? Last edited by Grey Cloud on Wed May 14, 2008 12:28 pm, edited 1 time in total. This is Wal's take on the "Dragon Storm". starbiter wrote: This is Wal's take on the "Dragon Storm". Sketch of the magnetosphere of Saturn, from Bagenal (1992). Saturn's magnetosphere is large and fast (10-hr) rotating like that of Jupiter. It also has internal plasma and neutral sources in the icy satellites and the rings, both with ephemeral atmospheres, and also Titan, which has a dense atmosphere. However, unlike Io, Titan orbits in the outskirts of the system, sometimes inside of it and sometimes "outside" of it and directly exposed to the solar wind. The Kronian and Jovian magnetospheres therefore have dominant or at least substantial internal mass and rotational energy sources against an external solar wind control, in contrast to the case of the Earth. In the 1980-1981 Voyager encounters, Saturn's magnetic field was found to be surprisingly aligned with the spin axis, and presents a simpler system than Jupiter's because the field non-dipolar terms are much smaller. 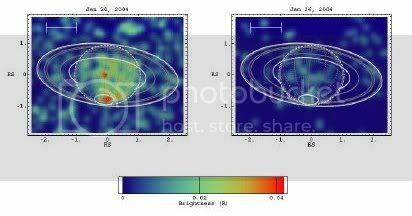 Saturn's aurora was also positively identified in UV emission and seemed to emanate from high latitude ovals thought to map to the magnetopause, although, as for Jupiter, the models and mapping are uncertain. Saturn' system may thus be controlled mainly by the solar wind interaction, rather than by internal forces. However, Voyager also revealed kilometric radio emissions (SKR) consisting of sychrotron radiation by precipitating auroral electrons. The SKR and some ring spokes showed some enhancements at a given magnetic longitude, thus indicating that longitudinal (and thus corotational) effects are at play as well. HST imaging will be key for untangling the behavior of Saturn's aurora and magnetosphere. Saturn in the far-ultraviolet (~1200-2100 Ang) in 1994 with the WFPC2 camera on HST. They were published by John Trauger et al. (1998). Saturn's disk and rings are seen in reflected sunlight (longwards of ~1600 Ang). The auroral emissions are easy to distinguish in the polar regions because those regions are dark in the UV due to UV-absorbing polar hydrocarbon hazes formed in turn by the auroral processes. Both emissions in H2 and H Lyman alpha are detected in these images. A strong auroral event was taking place in Saturn's morning aurora, as shown in the right figure. an HST press release also by Trauger et al., was obtained with the STIS instrument on HST. The STIS far-UV imaging mode has a about 10 times better sensitivity than a typical WFPC2 exposure, and about 4 times the spatial resolution (eg, the Cassini division of the rings is now clearly visible). Details of the aurora can now be better studied. The STIS far-UV MAMA detector covers the 1200-1800 Angstroms, so there is also less reflected sunlight as compared to the WFPC2 images. By 1997 the northern hemisphere of Saturn was barely observable. Brighter morning emission is seen on the outh east limb, while a more diffuse emission is seen in the afternoon. The auroral double structure seen on the south east limb is an artifact since the image is a summation of two STIS exposures. The double structure in turn shows that the aurora has temporal and/or longitudinal variations. The latter explanation implies that Saturn's magnetic field is not at dipolar as previously believed. The emissions also show a not too smooth oval (towards the central portion of the Earth-facing side of the auroral oval). The figure on the left is a composite of WFPC2 sub-images of Saturn's north aurora reported by Trauger et al. (1998) . They show temporal variations in Saturn's northern aurora. 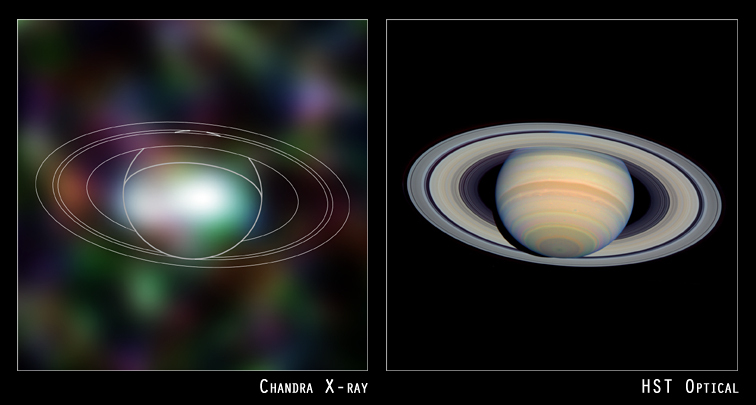 The top 4 panels show data obtained within about 5 hours on 9 October 1994 during the very first imaging of Saturn in the far-UV (of which the full first exposure is depicted on the left figure). Saturn was undergoing an auroral event, where bright emission remained fixed at 8 AM local time throughout the ~5 hours observing period. The auroral storm was dimming with time. Two observations taken on two separate dates in 1995 revealed very little auroral emission. Saturn's aurora was known to be bursty from both Voyager and contemporaneous IUE observations, and we think that Voyager may have observed on such morning auroral event. Such events seem to be typical of fast-rotating magnetospheres. (On Jupiter the events are fixed at dawn rather than at 8 AM in magnetic local time.) 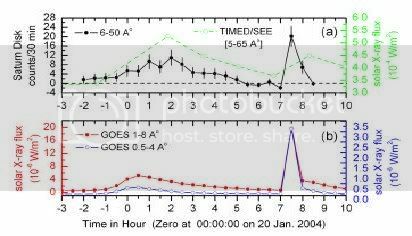 More information on the temporal behavior of Saturn's aurora can be obtained from analysis of the newer STIS data, because these data was obtained in the STIS time-tag mode. Coordinated observations should be made in the years to come with the Cassini mission in-situ solar wind and magnetospheric measurements. Because the rotational period of Saturn is highly uncertain, we do not know if the bursts of UV aurora enhancements are constrained in magnetic longitude. With HST imaging observations, made over extended periods and combined with Cassini in-situ data, we may be able to resolve this issue. The STIS images can also be used to resolve corotational versus magnetic local time effects from observing, like for Jupiter, throughout a good part of a planet rotation, as the features rotate from the morning to the afternoon. The Cassini spacecraft has revealed a never-before-seen level of detail in Saturn's F ring, including evidence for the perturbing effect of small moonlets orbiting in or close to the ring's bright core. For some time, scientists have suspected the presence of tiny moonlets that orbit Saturn in association with the clumpy ring. As the small satellites move close to the F ring core they leave a gravitational signature. In some cases they can draw out material in the form of a "streamer"--a miniature version of the interaction Cassini has witnessed between Prometheus and the F ring material. The dynamics of this interaction are the same, but the scale is different. See Thieving Moon for a view of Prometheus creating a streamer. A team of scientists led from the UK has discovered that the rapid changes in Saturn's F ring can be attributed to small moonlets causing perturbations. Their results are reported in Nature (5th June 2008). The Cassini images also show new features (called "fans") which result from the gravitational effect of small (~1km) satellites orbiting close to the F ring core. Bodies immersed in plasma aren't isolated, they are connected by circuits. Most of the time they are not in equilibrium because they are in unstable conditions. The majority of them are moving across the plasma filaments that exist in the solar system and in the plasmaspheres around planets. Currents in plasma contract into filaments (which are really sheets of double-layers folded into tubes) and the force between filaments is linear, so the electromagnetic fields created by the filaments are the most powerful long-range attractor in the universe. Presence of microscopic glassy spherules over a large area. The final result of the explosive fragmentation, melting and vaporization of the bolide will be a spray of glassy spherules beyond the point where the main plasma discharge and explosion took place. The creation of spherules by electric discharge and electrical fusing, a common effect of lightning, is now well demonstrated in the laboratory. Charged microparticles are an annoyance in the plasmas of fusion energy schemes and semiconductor manufacturing. But in laboratory plasmas and in space, they can be uniquely informative. What do the rings of Saturn have in common with industrial reactors used to manufacture semiconductor microchips? Both are examples of systems containing charged dust particles whose dynamics are controlled by electromagnetic and gravitational forces. More specifically, they are examples of dusty plasmas, defined as partially or fully−ionized gases that contain micron−size particles of electrically charged solid material, either dielectric or conducting. Dusty plasmas are common in astrophysical environments; examples range from the interstellar medium to cometary tails and planetary ring systems. interactions (Russell 2001; Waite & Lummerzheim 2002; Krupp et al. 2004; Clarke et al. Observatory (CXO) in April 2003 (Ness et al. 2004b). precipitating highly-ionized heavy ions (Branduardi-Raymont et al. 2004; Elsner et al. scattered solar X-rays (Maurellis et al. 2000; Bhardwaj et al. 2004, 2005a; Cravens et al. from the disk of Saturn. Chandra's image of Saturn held some surprises for the observers. First, Saturn's 90 megawatts of X-radiation is concentrated near the equator. This is different from a similar gaseous giant planet, Jupiter, where the most intense X-rays are associated with the strong magnetic field near its poles. Saturn's X-ray spectrum, or the distribution of its X-rays according to energy, was found to be similar to that of X-rays from the Sun. This indicates that Saturn's X-radiation is due to the reflection of solar X-rays by Saturn's atmosphere. The intensity of these reflected X-rays was unexpectedly strong. Further observations should help clarify the nature of Saturn's X-radiation, and determine whether Saturn's magnetic polar regions ever flare up in X-rays, as do Jupiter's. The features outside of Saturn's disk in the X-ray image are instrumental artifacts or "noise". We report the first unambiguous detection of X-ray emission originating from Saturn with a Chandra observation, duration 65.5 ks with ACIS-S3. Beyond the pure detection we analyze the spatial distribution of X-rays on the planetary surface, the light curve, and some spectral properties. The detection is based on 162 cts extracted from the ACIS-S3 chip within the optical disk of Saturn. We found no evidence for smaller or larger angular extent. The expected background level is 56 cts, i.e., the count rate is (1.6 ± 0.2) x 10-3 cts/s. The extracted photons are rather concentrated towards the equator of the apparent disk, while both polar caps have a relative photon deficit. The inclination angle of Saturn during the observation was ∼-27°, so that the northern hemisphere was not visible during the complete observation. In addition, it was occulted by the ring system. We found a small but significant photon excess at one edge of the ring system. The light curve shows a small dip twice at identical phases, but rotational modulation cannot be claimed at a significant level. Spectral modeling results in a number of statistically, but not necessarily physically, acceptable models. The X-ray flux level we calculate from the best-fit spectral models is ∼6.8 × 10-15 erg cm-2 s-1 (in the energy interval 0.1-2keV), which corresponds to an X-ray luminosity of ∼8.7 x 1014 erg s-1. A combination of scatter processes of solar X-rays require a relatively high albedo favoring internal processes, but a definitive explanation remains an open issue. and a well developed magnetosphere – are known to emit X-rays. planets, and XMM-Newton has observed them from Jupiter and Saturn. energetic heavy ions precipitating into the polar atmosphere. Chandra ACIS X-ray 0.24-2.0 keV images of Saturn on January 20, 26, 200441.
obscured by the rings. The white oval around the south pole defines the polar cap region. to that from the disk of Jupiter (Fig. 12). extension of its disk X-ray emission. similar to that seen in the solar X-ray flux. contribution to the disk X-rays33. Saturn and Jupiter act as “diffuse mirrors” that backscatter solar X-rays. away from near-Earth space weather satellites35,38,41. 1), and Saturn does not have copious heavy ion source, like Io on Jupiter. in April and November 2005; the data is being analyzed. have been detected from the rings of Saturn.